1861 bis 1865 Präsident der Konföderierten Staaten von Amerika und Führer der Südstaaten im Sezessionskrieg (1808–1889). 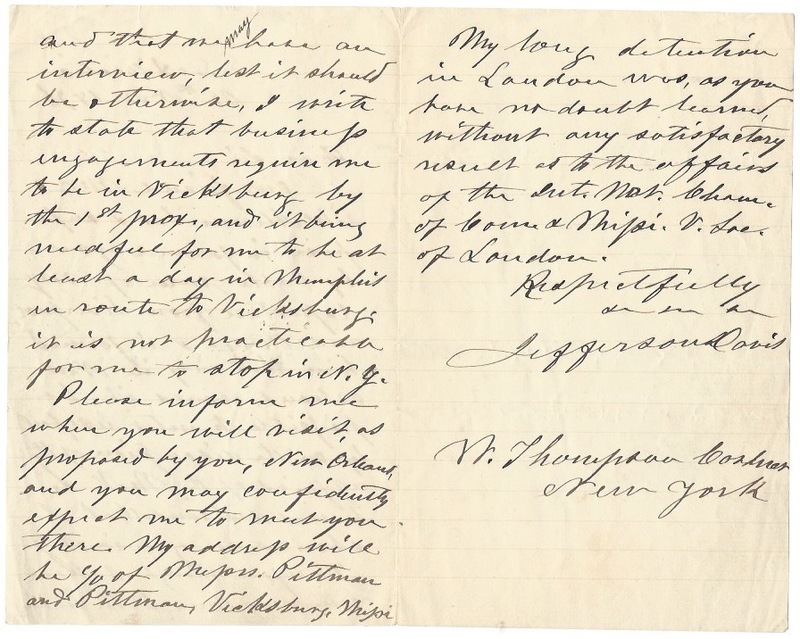 Autograph letter signed (“Jefferson Davis”). „S.S. Adriatic. 3 SS. auf Doppelblatt. 8vo. As president of the American office of the Mississippi Valley Society to W. Thompson Cordner: “Our friend Mr. McAllum has I suppose informed you, by cablegram of my departure from Liverpool, and though I informed him that only in New Orleans, would it be possible to enter usefully on the discussion of the affairs of the M.V.S., he was desirous that I should see you in N.Y. Therefore though I hope you may come to the landing and that we may have an interview, lest it should be otherwise, I write to state that business engagements require me to be in Vicksburg by the 1st prox., and it being needful for me to be at least a day in Memphis en route to Vicksburg, it is not practicable for me to stop in N.Y. Please inform me where you will visit, as proposed by you, New Orleans, and you may confidently expect me to meet you there [...] My long detention in London was, as you have no doubt learned, without any satisfactory result as to the affairs of the Int. Nat. Cham. of Comm. & Missi. V. Soc. of London [...]”. – In January 1876, Davis, who had been left nearly destitute by the Civil War, accepted the presidency of the American office of the Mississippi Valley Society at an annual salary of $ 6,000. The organization hoped to use British-built ships to increase commerce between the Americas and Europe, using the port of New Orleans as a base of operations. In May 1876 Davis sailed to London to meet with directors of the English branch of the company. He found that they had been able to attract very little capital investment in the venture. New York was still seen as the center of American commerce. 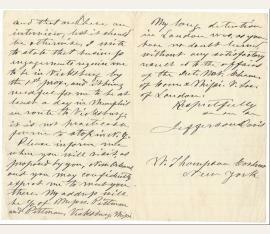 Returning home after his disappointing trip, Davis sent this letter to Cordner. Davis’s position with the Mississippi Valley Society terminated shortly after his return to New Orleans. He subsequently turned his attention from business prospects to the writing of his “Rise and Fall of the Confederate Government”. – Slightly dusty and with small traces of handling..